Hair removal cream is a less painful and much quicker alternative to shaving or waxing, and can leave the skin feeling smooth without having to worry about nasty bumps or nicks. 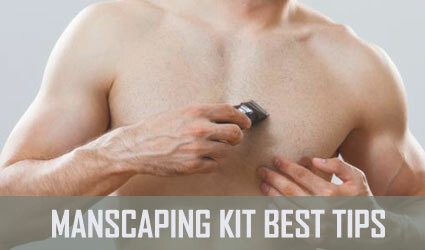 Shaving and waxing can take up a lot of time as well, so many tend to look to hair removal creams, since they get rid of body hair in minutes. We’ve selected some of the best hair removal cream options out there, based on quality, usability, user popularity, and overall rating. Most are made for those with sensitive skin, while others are a bit stronger. 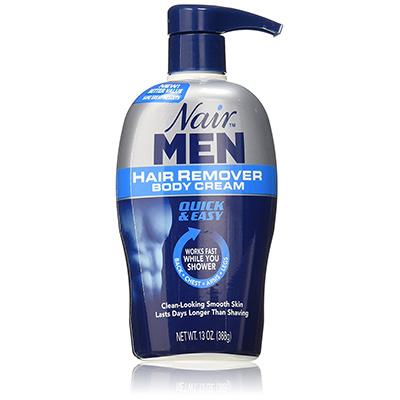 If you want to remove body hair quickly and easily, this hair removal cream has a sensitive formula that contains aloe vera, vitamin E, and baby oil, to leave the skin moisturized and free from nasty razor bumps. Being that it’s dermatologically tested, this cream is safe to use for removing hair close to the root, and because of its size, it’s easy to carry anywhere you go. 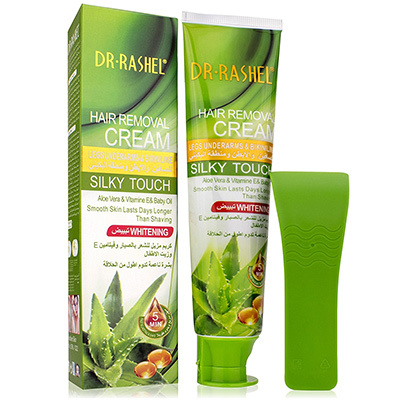 Dr. Rashel hair removal cream is suitable to use for underarms, legs, arms, and even the bikini line.  It’s one of the most popular hair removal creams available, although you have to apply a rather thick layer in order for the cream to thoroughly remove hair. Note: The Dr. Rashel Hair Removal Cream is currently unavailable but you can check out this Hair Removal Lotion by GiGi that works wonders on the arms, legs, and bikini area. Great for those with sensitive skin, this hair removal cream’s formula is made from plant and baby oil, to prevent irritation and leave the skin feeling moisturized. 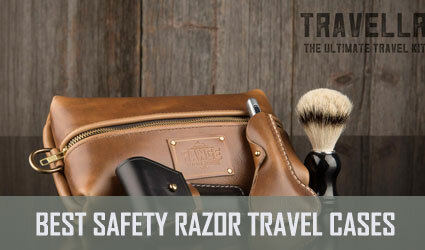 It’s easy to use, since all you do is apply an even layer, wait five minutes, and then gently wipe it off and rinse. Compared to shaving, this hair removal cream doesn’t leave any nicks or itchy bumps on the skin, and it removes hair closer to the root, leaving you hair-free for at least a week. You can use this cream for your underarms, chest, private areas, arms, and legs. Because of its gentle formula, we also see it as one of the best hair removal cream options to be used on the face: on the jawline, upper lip, and chin. 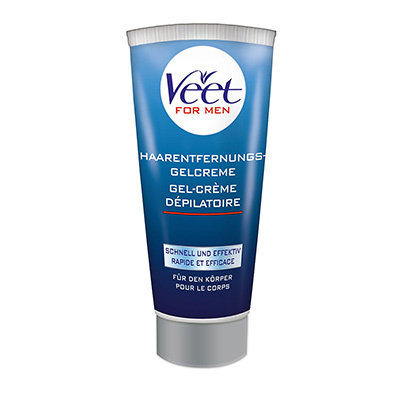 It can get tiring having to shave every couple of days, but this hair removal body cream is quick and easy to use, and keeps stubborn hair at bay for several days longer than shaving, since it removes hair close to the root. The cream is especially effective on coarse, thick hair. You can use it on legs, arms, the bikini area, and the face, with little irritation afterwards. While the cream leaves the skin smooth and clean, it can sting if left on the skin for too long, which can lead to some irritation and dryness. Otherwise, it’s ideal for removing hair if you’re short on time, and comes in a convenient pump bottle for a less messy application. 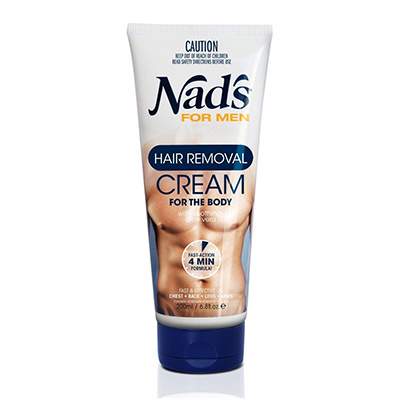 Suitable for use on the back, chest, legs, and arms, Nad’s For Men hair removal cream is designed to get rid of stubborn hairs within four minutes. It’s specially formulated with soothing aloe vera, to help protect the skin from flaking or itching after use, and to keep it moisturized to prevent the skin from tightening and becoming irritated. The cream is additionally safe to use on private areas, with little to no stinging. Although the cream is supposed to work in under four minutes, it may take longer for thicker hair, but shouldn’t be left on for more than ten minutes. 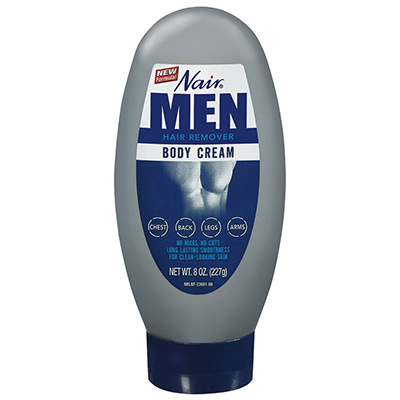 As a more comfortable alternative to shaving, this cream starts off as a gel, and then expands into a gentle foam as it works to remove hair from the legs, arms, underarms, and back. It works to get rid of stubborn hairs within five minutes, and leaves the skin feeling refreshed, as it activates with a cooling sensation. The gel cream is simple to use, for all you have to do is apply, wait, and wipe. 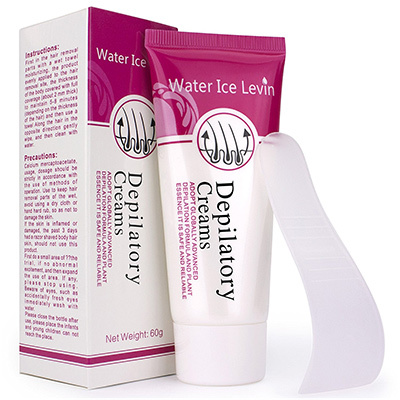 Because this cream is a bit harsher, it isn’t recommended for use on private or sensitive areas. 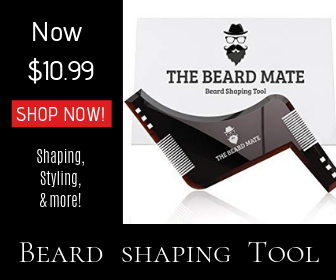 Otherwise, it works fast and effectively, removing hair at the root and keeping it from growing for several days. Shaving can often bring a lot of irritation, uncomfortable razor bumps, and accidental nicks to the skin, but this fresh and smooth moisturizing hair removal cream works to get rid of body hair at the source, and keeps it removed for days. It leaves the skin feeling soft and smooth, and is enriched with Shea butter to prevent stinging or irritation during and after use. The cream removes hair effectively within ten minutes, and provides better results than shaving or waxing. Although it has a slight chemical odor to it, it still does the job well. This is a similar hair remover to another recently mentioned Nair product, except for the fact that it comes off rather easily if your showerhead is running. It’s the best hair removal cream for use on the chest, back, legs, and arms, and can leave your skin clean and smooth. The cream ensures that hair won’t grow back for at least a couple of weeks, which is significantly longer than the few days that shaving gives you. The cream also exfoliates and moisturizes the skin, to prevent it from tightening or itching. It’s not too effective on particularly hairy areas, and can irritate the skin if left on for too long. The reason why this is our top pick for the title of best hair removal cream is because of its unique and sensitive formula. 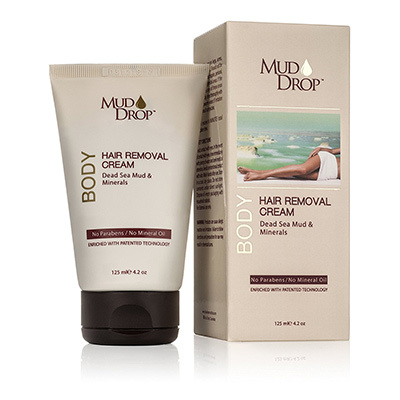 As the name suggests, the Mud Drop hair removal cream contains mud from the Dead Sea, as well as minerals. It contains no mineral oil or parabens, but it does come infused with chamomile extract and aloe vera leaf juice. 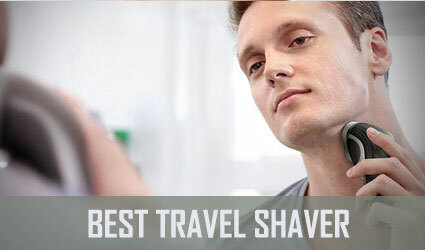 It manages to remove all unwanted hair in a matter of minutes, 6 to be more precise, and it is great for sensitive skin. Shaving or waxing can be painful and often leaves the skin irritated due to razor bumps, cuts, and peeling. Hair removal creams are a popular alternative for getting rid of body hair, since they works within minutes and leave the skin feeling smooth and soft. Did we miss any best hair removal cream that we should have brought up? Feel free to share your thoughts down below.